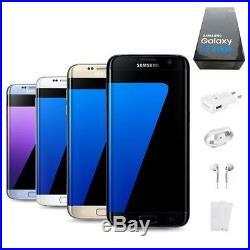 New & Sealed Factory Unlocked SAMSUNG Galaxy S7 Edge G935F Black White Gold Blue 32GB Android Smartphone. All our SAMSUNG smartphones are 100% BRAND NEW and ORIGINAL units and come intact in a factory sealed SAMSUNG box. These units are FACTORY UNLOCKED which make them compatible with any SIM card worldwide. They also come with original English firmware. SAMSUNG Galaxy S7 edge is a 5.5-inch capacitive touchscreen display in dual edge Super AMOLED technology. Tip of the day: AMOLED stands for active-matrix organic light-emitting diode. This AMOLED technology adds a layer of semiconducting film behind the OLED panel which activates each pixel more quickly. The result is brighter, more vibrant and vivid colors, and very deep blacks - stunning imagery that sometimes even beats real life! Available in 32GB ROM, 4GB RAM storage option, the S7 edge is equipped with a highly reliable and dependable Octa-Core processor to ensure faultless performance. Watching HD videos, downloading web pages and gaming becomes the norm while 3D gaming or heavyweight multi-tasking is a breeze. A good smartphone is also measured by its ability to take good photos. The dual pixel 12MP sensor can focus as quickly and as seamlessly as the human eye, even when the light starts to fade. And with an aperture of f/1.7 and Tracking AF (autofocus) function, fast moving subjects are captured while in motion, clear and focused. The S7 edge lets you capture sweeping movements in panorama with motion. Scroll on to the Feature Highlights section below to find out more about Motion Panorama and Motion Photo. There is also a 5MP front camera with Spotlight in Beauty Mode, Selfie Flash and Wide Selfie angle options for the perfect selfie. Youll even have options to screenshot or record a gameplay and share it online for the world to see or even block incoming alerts during gameplay. Last but not least is KNOX - SAMSUNGs around the clock protection against hackers and malware, enforced by regular updates. Thanks to KNOX Enabled App, your sensitive data is safely isolated and encrypted. Stylishly beautiful and intelligent inside out, the SAMSUNG Galaxy S7 edge was designed to make your life sweeter. SAMSUNG Galaxy S7 edge, made for you, meant for you. 5.5 dual edge Super AMOLED Capacitive Touchscreen. 2.3GHz, 1.6GHz Octa-Core Processor. Dual Pixel 12.0 MP, f/1.7 aperture rear camera with flash and auto-focus. CMOS 5MP, f/1.7 aperture front camera. GPS, Wi-Fi, NFC, Bluetooth v4.2. 3600 mAh battery with fast charging capabilities. Sensors include fingerprint, accelerometer, geomagnetic, gyro, barometer, HR, hall, proximity and RGB light sensor. Powered by SixBit's eCommerce Solution. 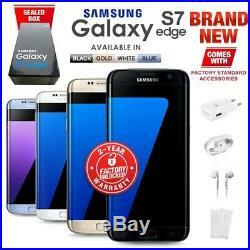 The item "New Unlocked SAMSUNG Galaxy S7 Edge G935F Black White Gold Blue Android Phone" is in sale since Monday, January 7, 2019. This item is in the category "Mobile Phones & Communication\Mobile & Smart Phones". The seller is "t-gadget" and is located in Essex. This item can be shipped worldwide.